Did Santa forget your new Jeep? No worries, this beauty could be yours for the cost of a foofoo Frappuccino! If a fully decked Jeep was more than Santa could fit in his sleigh, the folks from the California Four Wheel Drive Association (Cal4Wheel) might have you in high cotton (or snow, sand, or mud) before the first day of spring. 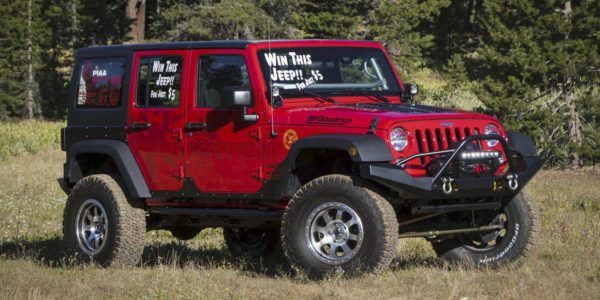 Carrying on a 40-year tradition, they have again sourced a new Jeep, this time a 2016 4-door Wrangler JK, and will be raffling it off during their annual convention. This year’s Cal4Wheel JK has been prepared by Poison Spyder Customs in Banning, California, and features a host of their heavy-duty accessories including front/rear Brawler bumpers, Bombshell differential covers, body armor, grab handles, and shackles. 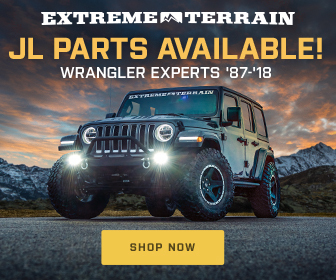 Peeking under the rock rails you will find a MetalCloak Game Changer suspension and shocks along with upgraded front/rear Dana axle shafts, locking differentials, and gears. BFGoodrich KO2 All-Terrain tires wrapped around Raceline’s Avenger alloy wheels will provide traction when it’s needed, while a Magnaflow cat-back exhaust system channels spent gasses from the Pentastar 3.6-liter V6 mill. Other cool exterior swag includes a Warn Zeon 10-S winch fitted with Spydura synthetic rope and a Factor 55 Pro Link thimble, PIAA LED light bar, flood, and corner lights, Hi-Lift X-Treme 48-inch jack, a Jackcovers protective case, and an Alien Base Hi-Lift stand. Rounding out the build is an ARB fridge/freezer, Spiderweb windshield shade, Tuffy Security locking cubby and center console, sPod 6-switch pod, and a Rock Hard Ultimate Sport Cage. Lest we forget recovery gear (not that this Jeep would easily get stuck); Poison Spider also ponied up for recovery straps and shackles. Raffle tickets are just $5 and the drawing will held February 18, 2017 at Cal4Wheel’s convention in Visalia, California (need not be present to win). Net proceeds go directly towards the fight to keep our public lands open! To order tickets go to http://cal4wheel.com/sweepstakes-vehicle or contact Sweepstakes Vehicle Chairman Steve Gardiner at 714-293-8790.